Social media, big data and artificial intelligence (AI) can be likened to the 21st century arms race. These innovations have disrupted the way we communicate, predict patterns/the stock market, national security (electronic intelligence and cyber-defence), and democracy, amongst others. Evidence abound of States, rogue states, non-state actors or ‘’lone wolves’’ (cyber troops) weaponizing information or launching information warfare (IW), psychological warfare (PSYWAR) or psychological operations (PSYOPs), and in some cases, manipulating social media with a bid to influencing the outcome of an election. This trend is apparently a global problem. Mr. Sean Gourley, an Artificial Intelligence(AI) consultant to the US Intelligence agencies warns that fake news may have already influenced politics in the US, but ‘’it’s going to get a lot worse’’. He argues that the next generation of fake news would be far more sophisticated thanks to AI. Another report foresees AI mimicking human voice leading to a ‘’complete destruction of trust in anything you see or hear’’. In October 2015, Finnish President Sauli Niinistö warned of the “information warfare” that was already affecting Finns, and said that it was the duty of every citizen to combat it. Finnish officials claim to have documented 20 disinformation campaigns against Finland emanating directly from the Kremlin. The Swedish Civil Contingencies Agency (MSB) acknowledges that, ‘Psychological warfare is becoming an increasing threat to Sweden with the country exposed to daily attacks of disinformation’. The Polish Foreign Intelligence agency – Agencja Wywiadu or AW says it uncovered a plan to sow discord between Poland and Ukraine and lead an “informational war…against Poland and in the interests of Russia.” Disinformation is also potent in Nigeria. Nigeria’s Minister of Information and Culture, Lai Mohammed, says ‘Nigeria is under siege of disinformation and fake news that can bring the country on her knees if not checked’. We understand that the infamous Cambridge Analytica sought to influence the Nigerian presidential election in 2015 and that AKPD Message and Media, A PR firm founded by former Obama campaign manager David Axelrod, also worked for the then Opposition. Weaponized Information: Is this the next Arms Race? A weaponized information (also referred to as weaponized narrative, cognitive hacking, or disinformation) is a message or content contrived to affect the recipient’s perception of an event or someone in a way that is not warranted thereby serving the strategic objective of the purveyor of the information. 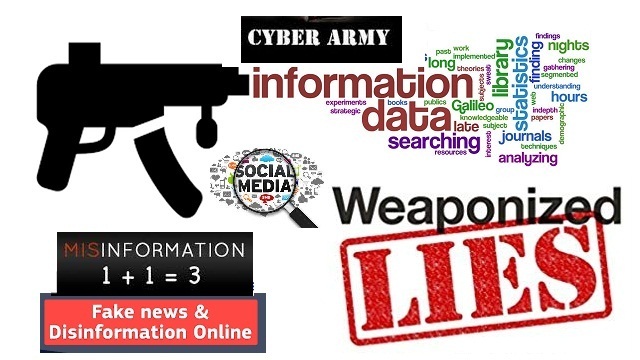 Weaponized information or disinformation is akin to hybrid warfare or hybrid threats – defined as a military strategy that blends political warfare, conventional warfare, irregular warfare and cyber-warfare, diplomacy with other influencing (social engineering) methods, such as fake news, and foreign electoral intervention deployed by both state and non-state actors to destabilize a country, organization or an opponent. Weaponized information could be a blend of truth, a faux pas, deliberate falsehoods (or fake news) aimed at spreading fear, paranoia, uncertainty and distrust about a product, an individual or even a country. A weaponized narrative can be authentic but taken out of context. An example is a remark intentionally selected from a longer statement and tweaked in such a way that it waters down or magnifies what the speaker said or meant. Just about anything – a trending topic, information or hashtag on social media can be weaponized. For instance, sequel to President Trump’s purported #lifeless comment about the Nigerian president, it appears ‘’lifeless’’ is now a popular lexicon on many online forums, social media platforms and the Nigerian public space. Another example is the #LazyNigerianYouth comment and hashtag which trended on Twitter for quite some time. Information weaponization is interwoven with what is referred to in military parlance as ‘’Information operations’’ – the collection of tactical information about an adversary as well as the dissemination of propaganda in pursuit of a competitive advantage over an opponent, or as ‘’Sharp power’’ – the use of manipulative diplomatic policies or information warfare by one country to influence and undermine the political system of a target country. More often than not, weaponized information is astroturfed – disseminated in a way that masks the sponsors of the message or organization (e.g., political, advertising, religious or public relations) and they are made to appear as though the message originates from and is supported by grassroots contributors. Granted weaponized information, disinformation, information warfare and hybrid warfare are quite nuanced but permit them being used interchangeably in this discourse. From the United States to the United Kingdom, Sweden to Germany, weaponized information of disinformation is a proliferating global phenomenon. The Atlantic reports that ”disinformation is spreading on WhatsApp in India—and it’s getting dangerous”. The British embassy in Moscow recently accused Russia of spreading “disinformation” after London charged two supposed G.U. or GRU (Russian military intelligence) operatives traveling under the names Alexander Petrov and Ruslan Boshirov as the chief suspects in the poisoning of ex-spy Sergei Skripal and his daughter Yulia in the UK. In its piece titled – ”Disinformation Wars”, Foreign Policy says, ”Russian disinformation has become a problem for European governments. In the last two years, Kremlin-backed campaigns have spread false stories alleging that French President Emmanuel Macron was backed by the “gay lobby,” fabricated a story of a Russian-German girl raped by Arab migrants, and spread a litany of conspiracy theories about the Catalan independence referendum, among other efforts. The University of Oxford-based Computational Propaganda Project researched myriads of ways in which big data, bots and computational propaganda are employed in weaponizing information and manipulating public opinion over major social networking platforms. The research established that cyber troops are a pervasive and global phenomenon. The report asserts that, ”Many different countries employ significant numbers of people and resources to manage and manipulate public opinion online, sometimes targeting domestic audiences and sometimes targeting foreign publics”. Scholars argue that nearly 50 million accounts on Twitter are actually automatically run by computer bots – a software application programmed to run automated tasks such as interacting with and mimicking human users. In his article titled, ”How Covert Agents Infiltrate The Internet To Manipulate, Deceive, And Destroy Reputations”, fearless, adversarial journalist and co-founder of The Intercept, Glenn Greenwald chronicled the “dirty trick” tactics deployed by the Joint Threat Research Intelligence Group (JTRIG), a unit of the Government Communications Headquarters (GCHQ), UK’s intelligence agency, to manipulate and control online discourse. Israel is reported to have more than 350 official government social media accounts, covering the full range of online platforms, from Twitter to Instagram, and operating in three languages: Hebrew, Arabic and English. Ukraine’s i‐Army, also known as “the army of truth”, operates a website where citizens and volunteers can access and share “truthful” information on social media (Benedictus, 2016). Azerbaijan’s pro-government trolls have become a textbook case of state-level social media manipulation. The United State through the USAid allegedly created ZunZuneo otherwise known as ‘Cuban Twitter’ to stir unrest and undermine the Cuban government. Chinese Trolls (50-centers), pro-government netizens reportedly dispense an estimated 450 million fake social media comments in a year aimed at distracting the public from government policy-related issues that threaten to anger citizens enough to turn them out onto the streets. There is also the notorious Internet Research Agency, a Russian troll factory which specializes in churning out fake news and propaganda on the internet and social media platforms. Government supporters in Iran created websites to mimic the BBC’s Persian service, but instead “filled them with conspiracy theories and anti-Western propaganda.” Also in Iran, hackers created mock websites of Syrian opposition leaders in “social-engineering schemes.” A recent BBC investigation found that online trolls and fake accounts poisons Arab social media, particularly in the year-long propaganda war between Qatar and its Gulf neighbours. Oxford University researchers say one-in-three news articles shared online about the recent Swedish election involves widespread online disinformation or “junk news”. Using machine learning, the Swedish Defense Research Agency established prior to the September election that ‘’Twitter bots proliferated ahead of Sweden’s election. The report says the suspected Twitter bots were 40 percent more likely to support the anti-immigrant Sweden Democrats (SD) than human users’’. On September 9, 2018, Swedes went to the poll to elect members of its Parliament – Riksdag who will in turn elect the Prime Minister. As predicted, anti-immigrant party, Sweden Democrats (SD) made sizeable gains. Their share of the vote jumped from 12.9% to 17.6, so far at the expense of the two main parties in the country’s General Election.